Finally my first post on the electrical utility industry. Rather than go into the esoteric minutiae of the utility business I thought I'd keep it high level at first. I'll give you the methods: Hydro, coal, nuclear, natural gas, wind, oil, other renewables (solar, biomass, geo). The answer was quite surprising to me. Here's one way to look at it. 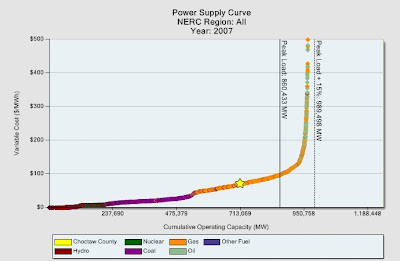 This is the generative capacity available from all existing generation plants in the US. 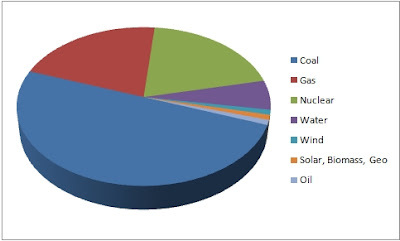 The big generation assets are coal (32%) and natural gas plants (40%). But I was quite surprised at how much electricity is generated from both nuclear and hydroelectric. Together they make up 20% of all capacity. The other way to look at this is from an actual generation standpoint. You see we have different electricity demands at different points in the day and different points in the seasons. We generally require a lot of electricity around late afternoon (a lot of consumer use and factory use) and not so much at night. We generally use more in the summer (AC) and less in the winter. But electrical demand must be met instantaneously. Plants must be standing by, ready to ramp up production. Some plants are on all the time -- 24x7x365. These are called 'base load' plants. Plants that aren't on all the time are 'peak load' plants. So just because a plant can generate 50MW of power doesn't mean it will. Some plants are on and some are off. What plants are on all the time? The cheapest ones to operate. I've talked before about cost curves. Here's the actual cash cost curve for electrical generation in 2007. This is every plant in the US. I have this great service that allows me to play with all this data. So take a close look. The Y-axis is the 'variable cost' or cash cost of producing a MW of energy. The cash cost is not equivalent to the 'all-in cost'. The cash cost is literally the cash expenditures necessary to run the plant to generate on MW/h. There are other costs like depreciation which are not cash costs and represent a measure of the capital necessary to build the plant (capex). But capex is a sunk cost. Once you build the plant you don't get that money back. You, as a business, require some return on this investment but it doesn't influence you desire to run the plant or to mothball it. These two measurements of the cost to run a plant are important. The X-axis is the cumulative generative capacity. So this is a plot of the cheapest plant to run on a cash cost basis (the plant all the way to the left) to the most expensive (the plant all the way to the right). The price of electricity at any given time is determined by the amount of electricity demanded and this cost curve. Figure out what the demand is, locate the plant that is the last plant to turn on on the curve above, follow it up to the cash cost for that plant, and that is the cost of electricity to the company that ultimately delivers it to your sockets. The higher the demand the higher the cost of electricity. Peak rates, or rates in the afternoon are higher than those in the middle of the night when demand is lower. You can also see some coloring. This is based on what type fuel the plant uses to create electricity. In general renewable energy has the lowest cash cost. The sun and water don't have any costs associated with them and they generally don't require a lot of people maintaining the system. So they have very low cash costs. Nuclear is the next cheapest since it is fairly automated. Coal is next since coal is so cheap. Natural gas plants are next since it is more expensive. So what can we tell from this chart? That nuclear and renewable plants are almost always on (at least when the sun is shining and the rivers are flowing). Coal plants are largely always on, and natural gas plants are largely used when demand increases. So we can also look at the generation profile from the standpoint of what types of fuel do we use to actually generation power. Since Natgas plants aren't on all the time, the percentage of energy generated from those plants drops and everything else increases. From this standpoint coal makes up 50% of our generation. Nuclear, Water, Wind, Solar, etc., now make up closer to 30% of our generation. Natgas drops down to 20%. So from a clean air perspective this is the problem we have as a nation. Coal is the dirtiest generation type. It kicks out the most carbon per MW/h and it kicks out the most SOx and NOx and mercury per MW/h. BUT!!! It's 50% of our generation. And the reason for that is we are the Saudia Arabia of coal. We have huge seams running through the Appalachians and Colorado/Wyoming/Montana (Powder River Basin). Replacing that is going to take a LONG LONG time. Many states have Renewable Portfolio Standards. RPSs are a goal to produce a certain amount of their electricity from 'renewable' sources by a certain time. Renewables is in quotes because each state defines that differently. "20/20" is a common goal. 20% of generation from renewables by 2020. If that sounds more like a marketing group came up rather than a group looking hard at where a state is and how it can get there you'd probably be right. While I'm insanely bullish on solar it represents 0.02% of generation in the US in 2007. To ramp that or Wind generation to a point where we can replace meaningful coal generation is going to take a long time. We would need 2,500 time more solar plants to replace coal. That type of solar production capacty will take decades to build. The only way to really quickly replace coal generation (and by quick here I'm still talking decades) is to introduce nuclear. Nuclear has it's own 'clean' problems but carbon isn't one of them. SOx isn't one of them. NOx isn't one of them. Mercury isn't one of them. And that's why plenty of people are really bullish on nuclear. After the last energy crisis, France took this approach. I believe 80% of their generation is nuclear based. One could argue that they now have a radioactive problem. But fundamentally the question comes down to, do you want a radioactive problem or a carbon/pollution problem?